All the above are prolific in thier ways of manipulating the photograph to make a composite image or something that looks un-natural. This photograph is made up of various parts of other images as none of the 4 subjects were actually in the room together, especially whistlers mother, a famous painting which has been included in the composite. Oscar Gustave Rejlander, known as ‘the father of art photography’. Similar to Peach Robinson, used a collection of parts of photographs to create one large scene in the above case using over 30 different negatives to create a tableau image. Uelsmann is a master printer, producing composite photographs with multiple negatives and extensive darkroom work. He uses up to a dozen enlargers at a time to produce his final images, and has a large archive of negatives that he has shot over the years. Uelsmann does not carry multiple attachments, but only one camera, “Most photographers carry many cameras with multiple attachments. Most photographers have one enlarger. I have half a dozen.” When beginning to create one of his photomontages, he has a strong intuitive sense of what he’s looking for, some strategy for how to find it, and an understanding that mistakes are inevitable and are part of the creative process. His process begins after a day of shooting. He returns to his work station in his home and covers a large drafting table with hundreds of proof sheets. He folds and overlaps various contact prints, explores the visual possibilities, then brings the options into his darkroom. He then sets his selected pieces into the large number of enlargers that he owns in his darkroom, and moves the photo paper progressively down the line, building up an image. The negatives that Uelsmann uses are known to reappear within his work, acting as a focal point in one work, and background as another. Similar in technique to Rejlander, Uelsmann is a champion of the idea that the final image need not be tied to a single negative, and may be composed of many. During the mid-twentieth century, when photography was still being defined, Uelsmann didn’t care about the boundaries given by the Photo Secessionists or other realists at the time, he simply wished to share with the viewer, the images from his imagination and saw photomontage as the means by which to do so. Unlike Rejlander, though, he does not seek to create narratives, but rather “allegorical surrealist imagery of the unfathomable”. Uelsmann is able to subsist on grants and teaching salary, rather than commercial work. Uelsmann’s interpretations of landscape elements, reworked, tweaked, and recontextualized, force the viewer to actively interact with his subjects. Continually in his photographs the viewer is confronted with entrances, whether they be gates, windows, trap doors, or ordinary doors. 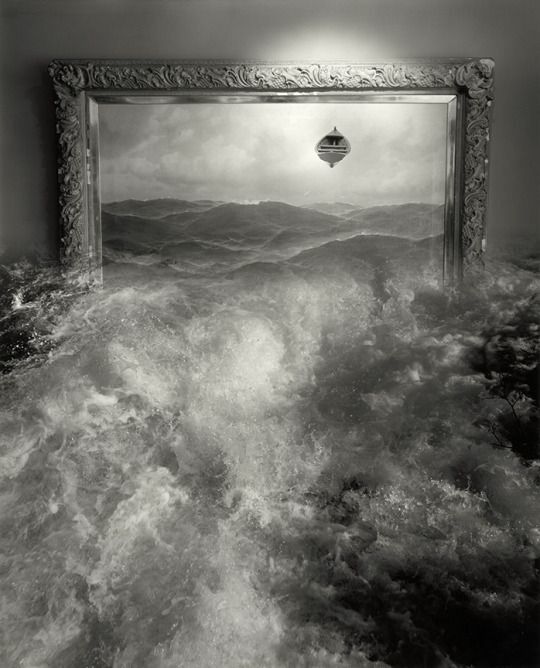 Usually the entrances are shut, but even when they are not, Uelsmann does not allow his viewer to see inside so the viewer must imagine what is inside. This is an example of the viewer having to actively interact with the photo they are forced to think more deeply and critically about their own interpretation. In Uelsmann’s art there are many right answers – and discovering them is a process that involves both artist and viewer. 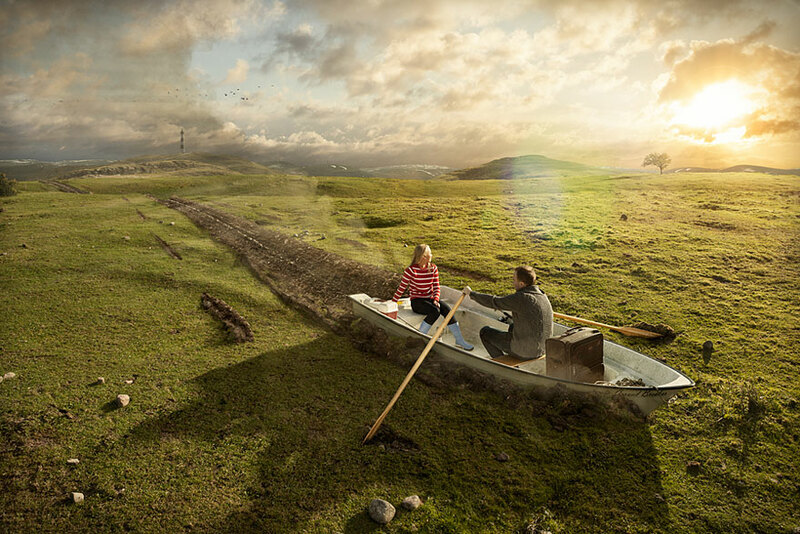 Erik Johansson is a photographer and retoucher from Sweden based in Prague, Czech Republic and Sweden. He is working on both personal and commissioned projects with clients all around the world. Erik doesn’t capture moments, he captures ideas. With the help of his camera and Photoshop the goal is to make it look as realistic as possible.